There is a raging debate throughout America about the best way to provide quality healthcare to all of Americas' citizens. The arguments for a national healthcare plan vs. plans provided by the private sector continue to fuel the controversy. While this debate continues millions of Americans without health insurance continue to suffer. To help fill this need for the uninsured many doctors, nurse practitioners, nurses, and community volunteers are finding ways to step up to help the uninsured. With the help of concerned individuals, foundations, and corporations, volunteer efforts are starting to emerge across the country to address this growing problem. 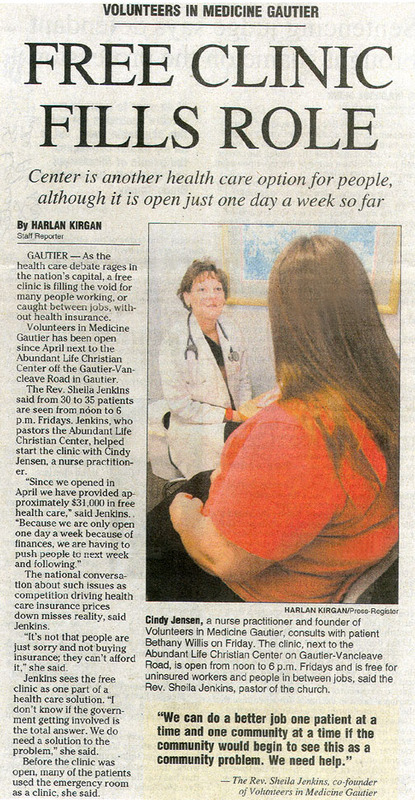 Volunteers in Medicine Gautier (VIMG) is one such healthcare organization working to provide quality healthcare to the uninsured. The article below and the information on this web site explain the important work VIMG is doing and how you can participate and help. Thanks for visiting our web site and please come back often. We would welcome your questions and involvement.